The City of Niagara Falls has various facilities that are permitted to host functions that involve alcohol. All rentals that wish to have alcohol present at their function must abide by the City’s Municipal Alcohol Risk Management Policy. The Arena's in have Ice and Meeting rooms available for rent. Visit the Arenas page to find out how to rent a room or rink. 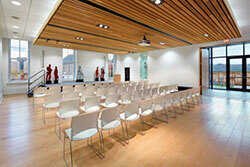 At the MacBain Centre, we have many rooms available in different configurations for your meeting. Find out how to rent a room at the MacBain Centre. The Museum has several rooms available for rent, most notably is the Theatre and Lobby area which is suitable for receptions or meetings. It is also possible to rent out the entire facility for special functions. The Willoughby Township Hall is a beautiful, historic building, located in southern Niagara Falls. The hall can accommodate family functions, meetings and other special occasion events. Equipped with tables and chairs and a fully functioning kitchen. Accessible washrooms are also available. The hall can accommodate at maximum of 90 people. Parking and outdoor space surrounding the building is available. To rent this facility, please complete the Willoughby Township Hall application form and a customer service representative will contact you regarding availability and to complete your rental application. Payments are to be made in person at the MacBain Community Centre - Recreation & Culture office, located at 7150 Montrose Road, Niagara Falls. Payments to include rental fee and HST. Insurance coverage is required and can be purchased through the City of Niagara Falls upon payment of the rental. for further information, please call 905 356 7521 extension 3330.